Cleansing and make-up removing dermatological wipes which respects the fragility of sensitive skin. Recommended for sensitive and intolerant skin. Open the sachet, take a wipe, and gently cleanse and/or remove make-up from your face, eyes and neck. Repeat until all makeup is removed. and naturally help rebuild the skin’s hydrolipidic film. 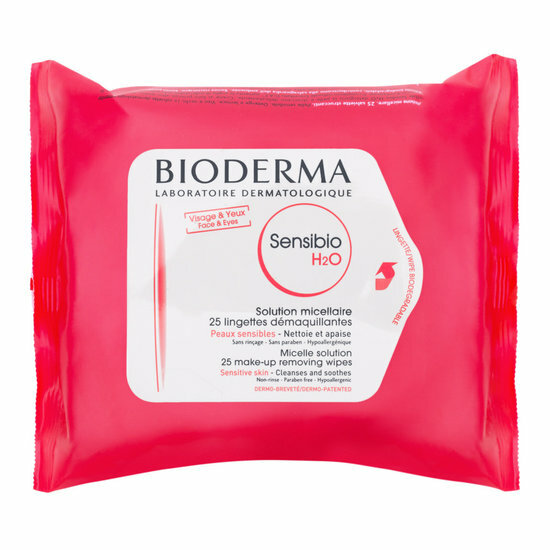 Thus, Sensibio H2O dermatological wipes guarantee a perfect cleansing and/or make-up removal for sensitive skin and eyes and an excellent tolerance and comfort. Enhanced with soothing ingredients, Allantoïne, Sensibio H2O dermatological wipes prevent the skin from feeling the irritation often caused by cleansing.